Pundits have been heralding the “death of email” for over a decade now. Ever since Facebook opened up to the public, certainly. Not surprisingly, it hasn’t happened, and in fact, email has seen increases in use by marketers in the recent past. Not only does email marketing still represent the best ROI of any marketing medium (with returns like $40 for each $1 spent), but it continues to lead the way for e-commerce stores both for driving direct sales and branding. Case in point, InternetRetailer.com recently ran a case study about clothing retailer, April Cornell, driving sales with email marketing. The high-end clothing retailer lost most of their customer data (note: always make backups regularly!). Without a second thought, they turned to email to rebuild their list and re-engage their customers and subscribers. That campaign, lead by the header “Oops! We lost your email.”, got an open rate of 31%, a CTR of 55%, and a conversion rate of 3.2%. Not bad. 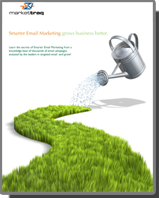 Even better, the company reports that they receive a 16-to-1 return on email spend. Go Mobile: Designing emails for mobile browser compatibility is not just important anymore, it’s absolutely mandatory. Last year, over 70% of consumers used a mobile device to check their email at least once, and that number will grow over the coming years.This is especially true when targeting younger demographics, the majority of whom rely on their cell phone as their primary communication device (including reading email). Though formatting email for mobile devices can place constraints on creative content, as well as on technical presentation, it’s well worth the trouble. For some tips, tricks, and best practices for mobile email design and formatting, contact us to get our email best practices guide. Get Social: Social is still growing in popularity, and while many marketers are already using social channels to get their message out, a much smaller number are combining social and email into a coherent cross-channel strategy. This is a major problem, and could lead to lost sales and missed opportunities. When retailers asked subscribers to participate in a Facebook activity (e.g. entering a contest, or answering a question), they got 50% more engagement than without the email. Moreover, they got 100% more engagement if they sent two emails asking for participation. Retailers who ask for Twitter promotion in one email got a 25% higher engagement (re-tweets for example) and sending two emails netted a 40% increase in engagement. Impressive? Tweet it! These numbers often surprise marketers, especially given the criticisms of email as an outdated medium that can’t keep up with social’s rise, but they make perfect sense when you think about it. Email is still largely considered the most trusted communication channel, a title that social appears to be a long way away from taking over. In that context, it’s obvious that a request that comes over a more trusted channel will get a better response. Another potential reason for these findings is the directness of email. In 2011, Facebook users posted an average of 1,851,000 status updates, 1,587,000 wall posts, 10,208,000 comments, and 2, 716,000 comments every 20 minutes (source). That’s a lot of noise for users to sort through. While there aren’t any concrete stats on how many emails are received by individuals daily, it seems that that numbers is much closer to 50-100 per day, counting work and personal emails (source, source). It’s a lot easier to break through the clutter when you’re dealing with 50-100 competing messages than when you’re up against 140 Million. Despite pronouncements of email’s death, it remains one of the most dynamic, efficient, and effective mediums available to marketers and retailers. While technology changes around email marketing, it’s a flexible enough channel that it can adapt and grow and adapt to these changes. As long as email marketers keep abreast and ahead of changing consumer behaviors, this medium will continue to thrive and drive growth long into the future. Watch for email to get more social (for example Google’s “Plus” integration with Gmail) and more relevant as marketers integrate data sources and find it either to use them to personalize message content. Also watch for email to continue to get more attention as filtering improves and keeps more and more of the worst spam from ever being seen. Things really are and we see them to continue to look up, for email marketers.